One method I use to select the movies I watch at the cinema is by paying attention to the trailers that run before the films, and that was how I saw the Side Effects preview last year. I was immediately intrigued because it was by Steven Soderbergh, one of those directors I respect, and who made the Ocean's Eleven series. I have also watched Out of Sight, Solaris, and Erin Brockovich so I know to watch out for his movies. He also directed Contagion which we had seen the previous year. Contagion did not disappoint, with its intricate plot, the disturbing realism of the story line, and the awesome performance of the actors, and I feel Side Effects will be somehow alike. Contagion was about a disease that spread so quickly even before investigators realized where it originated from. It reminded me of AIDS, Ebola, SARS, or worse. 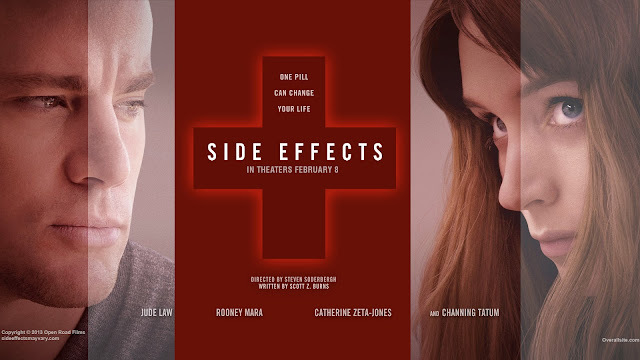 When the preview for Side Effects started, I took it as another romantic thriller until some of the characters began to fling pills around and then the title took on a whole new meaning. 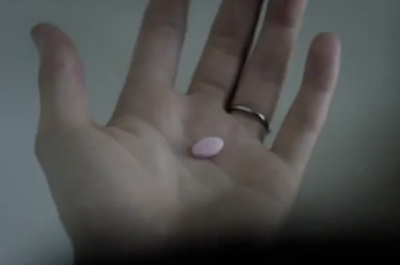 Who else finds it disturbing that the 30-seconds pharmaceutical ad spots on TV have 70% of their time spent in listing the side effects of the drug being advertised? The tag line at the end of the preview states, "In some instances, death might occur", and that quote is usually repeated in a lot of such ads. I often wonder when I listen to all the horrible side effects why the drugs are even on the market. It seems I'm not the only one and it would be interesting for me to see what story has been crafted around drug side effects and how Steven Soderbergh has directed it. I am equally looking forward to seeing the performances by the actors - Jude Law, who was also in Contagion, as well as Rooney Mara (Girl with the Dragon tattoo) and Channing Tatum. It's been a while since Catherine Zeta-Jones was on the big screen and seeing her in the trailer reminded me of why I fell in love with her in Mark of Zorro. Side Effects opens February 8th, 2012 and we'll surely be going to see it. For more information, check out Side Effects social media pages: Facebook and Twitter. Who else has seen the trailer? Answer this question to enter to win 2 nights at a New York City hotel, airfare for two to New York City from the continental United States and a $50 movie gift card: Why are you excited to see Side Effects?" d: For those with no Twitter or blog, read the official rules to learn about an alternate form of entry. This sweepstakes runs from 1/21/2013-2/10/2013. 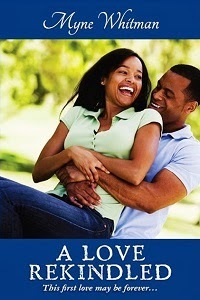 Be sure to visit the sponsor's brand page on BlogHer.com.